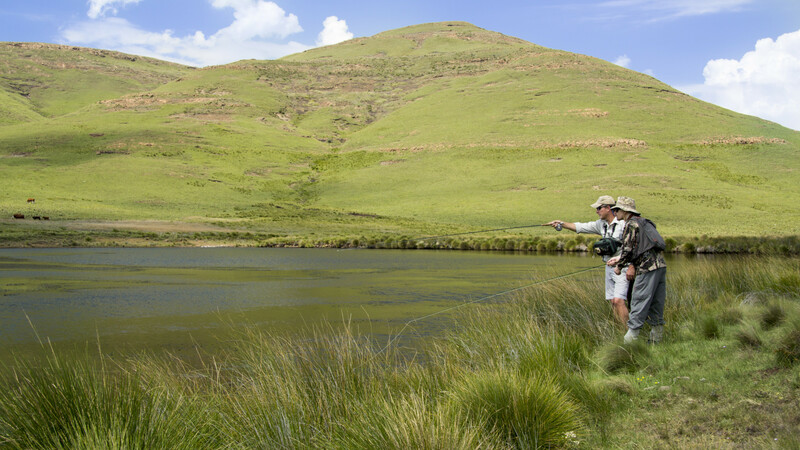 Dam: Pentland – top of the Riflespruit (stream). Where to purchase ticket: Linecasters fly shop 045 9749298. R150/rod/day. Access: A map of directions will be provided when a booking is made with Linecasters. Only 4×4 vehicles will be allowed to drive to this beat. This road also requires a very experienced off-road driver. A levy will be charged for the recovery of all vehicles that get stuck on this road. Scroll down for more information and a short video of Pentland. About the dam: The dam at Pentland was built in approximately 1987 on the upper Riflespruit. The dam is a self-sustaining fishery. The trout breed and fend for themselves in this dam. Target species: Wild spawning rainbow trout (Oncorhynchus mykiss). Best season: Rainbow trout from September to May. Dry Flies: DDD’s, elk-wing caddis, parachute adams, flying ants, klinkhammer’s etc. Nymphs and other: Slim body damsels, snails, dragonfly nymphs, woolly buggers, atomic worm, buzzers, beadhead PTN and Zak, flashback nymphs etc. Suggested fishing method: Stripping larger patterns on an intermediate line or dead drifting dries and smaller patterns on a floating line.